Urbanization and housing policies in Turkey have been transformed in a neoliberal fashion since the early 2000s. This has been accompanied by an abandonment of spatial planning to the benefit of the new competitive regionalism embodied in strategic urban planning with the objective of creating “brand cities.” Social policies in cities, the search for spatial justice fostering social diversity and support for disadvantaged populations are gradually being downgraded. The for-profit objectives of these policies also harm the environment and have caused many problems, including in health, public transport, mobility and housing. This current issue concentrates on Turkey’s approach to the environment and urbanization, which is also a vital global issue. Nihal Durmaz sheds lights on Law No. 6306, concerning natural disasters and ratified in 2012, which plays a crucial role in the justification of the new urban transformation projects. Durmaz shows how environmental risks, especially of earthquakes, have been brought into debates in order to regulate urbanization and consolidate a neoliberal urban land regime under the Justice and Development Party (AK Party). Durmaz argues that the implication of environmental risks in the process of urban transformation feeds various social and economic concerns and goes beyond its remit of preventing disasters. The current urbanization process in İstanbul has been far from perfect and resulted in a number of protests last years. Nezihe Başak Ergin brings an original viewpoint to this issue. Her article informs us that many campaigns have been organized in order to contest the forced evictions and demolitions caused by urban transformation projects in neighborhoods like Sulukule and Tozkoparan, the demolition of historical buildings like the Emek Movie Theater and Haydarpaşa Terminal and the implementation of large-scale urban development projects like İstanbul’s third airport, neglecting environmental concerns. Gülçin Lelandais analyzes climate change policies in Turkey between 2010 and 2012 from an institutional perspective. The article shows that international institutions, transnational pressure and Turkey’s EU candidacy played an important role in the implementation of policy measures in this realm. The study argues that this process was motivated by a search for prestige rather than a real will in Turkey to adapt to the consequences of climate change. Beatrice Kabutakapua’s article focuses on the multicultural dimensions of İstanbul, mainly in Tarlabaşı, and how it is affected by current urban planning. Her article depicts the transformation of this neighborhood as a gentrification project to socially and economically upgrade the area, which has been stigmatized as a criminal and unsafe neighborhood. 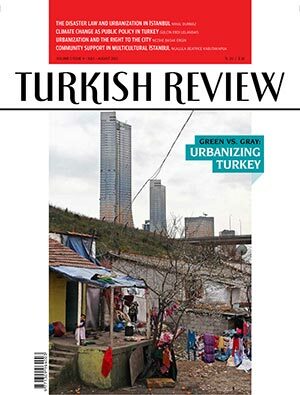 In this issue, Two Views includes interviews with EMBARQ Türkiye Director Arzu Tekir and Professor Korhan Gümüs from Mimar Sinan University, who address crucial topics in democratic and participative urban planning. Both emphasize the lack of collaboration with civil society and coordination problems within public administration, whether it is for sustainable transportation in cities or for urban projects like the transformation of Gezi Park and Taksim Square. The Last Word this issue is with “Ekümenopolis” director İmre Azem, who shares his thoughts on the changing face of İstanbul. Par lelandais78 dans Uncategorized le 26 août 2015 .